Just a quick post. I still have an inch or two to knit on the legs before I get to the heel. 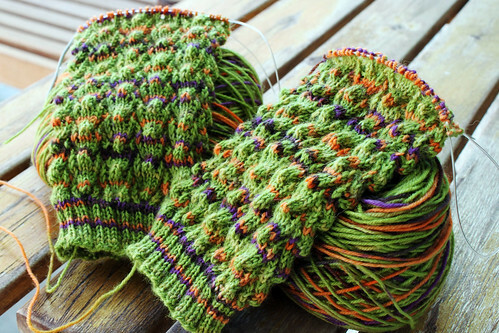 I am knitting a little off color pattern in the yarn, so I have to concentrate on tension to get the pattern closer before I get to the heel where it will really show if it is off. I think this stitch is perfect for these socks. It is really stretchy. It hugs the leg, ankle, and foot. The new rib is better too. This entry was posted on Sunday, May 17th, 2009 at 3:00 am and is filed under Knitting. Tagged: Knitting. You can feed this entry. You can leave a response, or trackback from your own site.